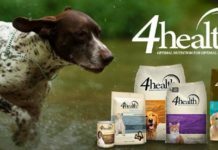 PetChatz® is part of Anser Innovation LLC, which was founded in February of 2011 by Lisa Lavin, Mark Kroll and Braden Kroll. Anser Innovation creates interaction technologies where remote connection is currently difficult, or impossible. Dr. Mark Kroll, is a former medical technology executive, and holder of more than 350 patents. He is also an inventor of more medical devices than anyone in the world. Lisa Lavin is a former veterinary medicine professional, seasoned business executive, and fourth-generation entrepreneur. Braden Kroll, is a high tech investor and business leader. When the company was first formed, Anser Innovation’s first priority was to enter the retail pet market with PetChatz®. Dr. Mark Kroll invented PetChatz® after realizing a need for pet parents to communicate with their animals while away from home. The original PetChatz® system was placed on the market at the end of 2014, and the new PetChatz® HD System in early 2016. Where are PetChatz® products manufactured? Anster Innovation headquarters is based in Minneapolis, Minnesota. All their products are either made, or assembled in the United States. The PetChatz® system is manufactured in Winona, Minnesota, and their pet treats are made at their partners’ facility in Minnesota. All the engineering behind PetChatz® is also done in the United States, mostly in the Upper Midwest as well. What is the PetChatz® HD System? The Pet Chatz® system is a way to wirelessly communicate with your beloved pet while you are away from home. Many people who share their home with animal companions often worry about their pets if they have to leave them alone for extended periods of time. The Pet Chatz® system is an innovative way to find out what your pets are doing during the day, or while you are on vacation, and remotely communicate with them. The PetChatz® system is only designed for dogs and cats. It is not safe to be used around other animals. The unit has a sound and motion detector built in, which sends alerts to your devices and allows you to interact and play with your pet. You can also record and share videos of you pet’s shenanigans while you are away away from home. In addition, there is the calming “PetChatz Scentz®” that can be remotely triggered to calm your animal with a soothing, aromatic scent. If your pet becomes too rambunctious, or anxious, you can disperse the scent into the air, which will help your furry friend feel a little more relaxed. You can still purchase the older model “PetChatz®0,” but the new “PetChatz® HD” offers a lot more benefits. What is the difference between PetChatz® 1.0 and PetChatz® HD? If you already have the PetChatz®0 system, it can be upgraded for a cost of $199.99 via the PetChatz® website. Another new and unique feature is PawCall®. The component can be purchased separately and allows your pet to initiate a two-way video chat. The device is a durable, pet-safe “light driven” button that can either be placed on the floor, or installed on the wall close to the PetChatz® unit. You set up times when you are available for a chat with your furry friend. When the preset time arrives, the PawCall® button begins to flash. There is also a ringtone that can be used to alert your pet. When your pet sees, or hears this, they “press the button” and two things happen – a treat dispenses as a reward for their knowing what to do, and you receive a text message that your pet is trying to reach you. You can turn the light on or off, depending on your availability to take the call. If you want to play a game with your pet while you are away from home, then set-up “Game Time” on your system. When the PawCall® button begins to flash your pet will become curious. If they decide to press the button, a treat will be dispensed, but if they ignore it, then they will miss out on the reward. You control how often and the length of time the game is played throughout the day. You can observe your pet’s antics in “Silent Mode,” so that you do not disturb their concentration, or anyone in your nearby surroundings. Simply position the unit over a low wall socket and install the bracket so that the unit will be positioned correctly, and then attach the system to the bracket. The fact it connects right over the outlet means that there are no cords, or wires for your pet to chew, or cause damage to the unit. For your pet’s safety, PetChatz® is also made of durable material and designed without any sharp corners, or edges that can be chewed. The PetChatz® app gives you onscreen instructions to connect your PetChatz® to your Wi-Fi and finish setting it up. If you are having difficulties, their customer service can be easily reached and are always more than happy to help you. To use PetChatz®, you will need a smartphone, tablet, or PC with webcam capabilities to support two-way video. Mount your PetChatz® camera over any electrical outlet in your home, where your pet has easy access to it. Connect the unit to your home Wi-Fi network. Use a Wi-Fi connection with a high speed (broadband) internet connection. It should at the very minimum have an upload speed of 2Mbps and 4 Mbps download speed. Connect the unit remotely by logging onto the PetChatz® website and downloading the PetChatz® app on your smart phone, or tablet. The app can also be downloaded from the iTunes. It is recommended that you use an Apple device with iOS 8.1.1., or later. The iPhone 5, or later is recommended to achieve high-resolution and high-frame rate video streaming. If using an Android device, it recommended to use 4.1, or later. At the moment the PetChatz® system is not compatible with Android products, but the company said it is under development. Watch the below video for How to Train Your Pet for PetChatz, to help get the most enjoyment out of the system. Another unique feature is the ability to surround your pet with a calming scent. The combination of essential oils are applied on a pad and diffused by an internal fan built into the system. The scent is vey useful especially if your pet ever feels anxious. It helps to calm them down and make their time alone a little easier. Jojoba, Marjoram, Orange, Lavender, Petitgrain, Vetiver, and Chamomile Roman essential oils. PetCatz® treats come in both chicken and salmon flavours. The company also offers a variety pack. The semi-moist miniature treats are holistic and natural. They do not contain any grain, corn, wheat, soy, added fat, by-products, artificial flavours, or colours. The ingredients are sourced in the United States, and manufactured in Minnesota. The primary ingredients are chicken, peas, potatoes, garbanzo beans, glycerin, molasses, flax seed, dried egg product, chicken fat (preserved with mixed tocopherols and citric acid), tapioca starch, sweet potatoes. The primary ingredients are salmon, peas, potatoes, garbanzo beans, glycerin, flaxseed, molasses, dried egg product, chicken fat (preserved with mixed tocopherols and citric acid), tapioca starch, sweet potatoes. 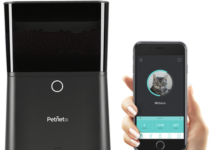 If either you, or your pet suffers from ‘separation anxiety’ when being away from each other for any length of time then PetChatz® is the perfect device for you. HD low-light camera: The original PetChatz® came with a VGA (960 X 480) camera without night vision. It has since been upgraded to an HD (1280 X 720) 30 fps, low-light camera. No wires for pets to chew. Ability for you to see your pet from anywhere, at anytime. Ability for your pet to call you at anytime. Able to interact with your pet. Can use the app to dispense treats. Able to release a calming scent in the air. You can record and share videos of your pet with your friends and family. Able to download the app from the Apple store. PetChatz products are available in the PetChatz Store, or on Amazon for customers in the United States and Canada. Requires high speed internet, if you want a clear HD experience. People with slower speeds will not obtain a sharp image. At the moment the PetChatz® system is not compatible with Android products, but the company said it is under development. The PetChatz® HD system is a little pricey at $379.99, with an additional $99.99 for PawCall®, however for many pet parents no price is too high when it comes to the enjoyment and safety of their furry loved ones.